The EU Commission indexes show that the weakening trend in Europe is still in play. 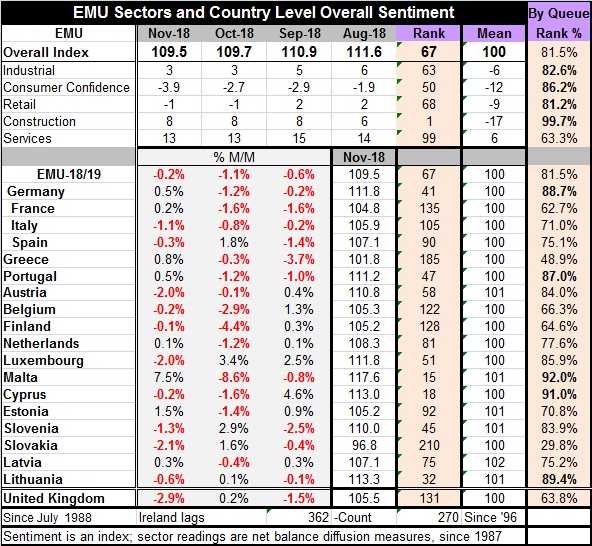 The overall EMU index of sentiment eroded to 109.5 in November from 109.7 in October. The pace of decline has slowed. And yet the ranking statistics show that the sectors are still quite solid and even strong in some cases, but they are well off their earlier ebullient readings except for construction where the percentile standing is in its 99.7 percentile! The ranking for the EMU index overall is in it 81.5 percentile, close to slipping into the 70th percentile decile which is a still ‘solid’ but less robust decile of readings. Services have only a 63.3 percentile standing, a still-firm and well above median level but no longer ‘strong.’ The industrial and retailing sectors carry rankings in their respective low 80th percentile decile around the level of 82. Along with the construction reading the industrial and retail readings were unchanged this month. The service sector reading was unchanged. All the slippage came from consumer confidence where the index fell to a net reading of -3.9 from -2.7 but still held to an 86th percentile standing. On a country by country basis, there was slippage in 10 of 18 reporting members. This is down from the 13 that slid last month but equal to the number showing losses in September. It remains at over half. The two largest EMU economics logged gains this month: Germany (+0.5%) and France (+0.2%). But the next two largest economies showed losses: Italy (-1.1%) and Spain (-0.3%). Italy continues to arm wrestle with the EU Commission about its budget. Over six months, there are net decline in the headline index for 14 of 16 countries. The largest declines are from Finland and Slovakia (at -5.8 points each), followed by France (-3.8), the Netherlands (-3.4) and Italy (-2.5). Small countries have the relative best performance with Malta (+1.7) and Estonia (+1.0) showing gains and Lithuania (-0.1) showing a very small decline. Cyprus and Belgium also show small declines (of -0.6 points). Germany has a six-month decline of only -0.9 points, much less than the 3-point six-month drop recorded by the EMU headline. Despite the ongoing nature of the declines, they are actually beginning to diminish. Over 12 months, only 2 of 18 countries show a gain in their EU eco-sentiment indicators. Over six months, three countries show gains. Over 12 months, three also show gains. Looking at Europe more broadly, nine of 26 countries show increases in their EU index over three months compared to three with increases over six months and five rising over 12 months. While evidence of recovery is not strong, there is no sign of the weakness spreading or more indications that the slowing is losing momentum. Despite the slowing in the EMU and a drop in the German forward-looking GfK consumer confidence index for December, Germany’s unemployment rate fell today to 5.0% from 5.1% a new post reunification low. But labor market data are often lagging signs. Since the weakness gets some of it drag from the fear of tariffs, if the G20 meeting does not provide a tariff deal between the U.S. and China, it is quite possible that the weakness here will intensify. The smell of risk is still in the air.